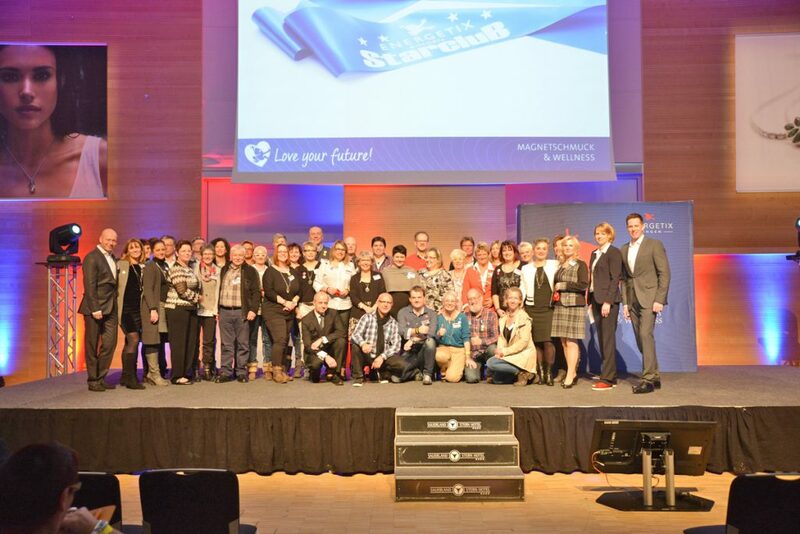 ENERGETIX’s highly anticipated event to kick off the new year was staged under the motto of ‘Love your future!’ at the popular winter-sports resort of Willingen on the third weekend of January. 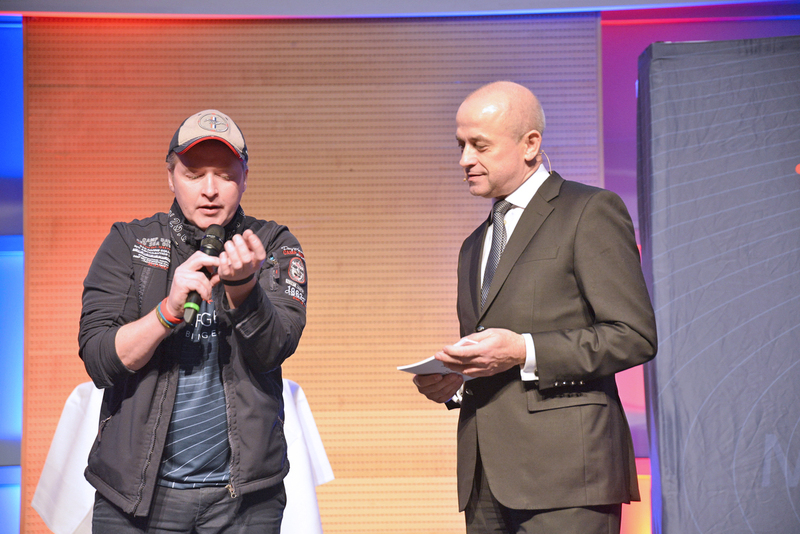 As the snow, which turned the Sauerland region into an unforgettable white winter wonderland, continued to fall, around 450 business partners from all over Germany arrived to usher in the new business year for ENERGETIX. 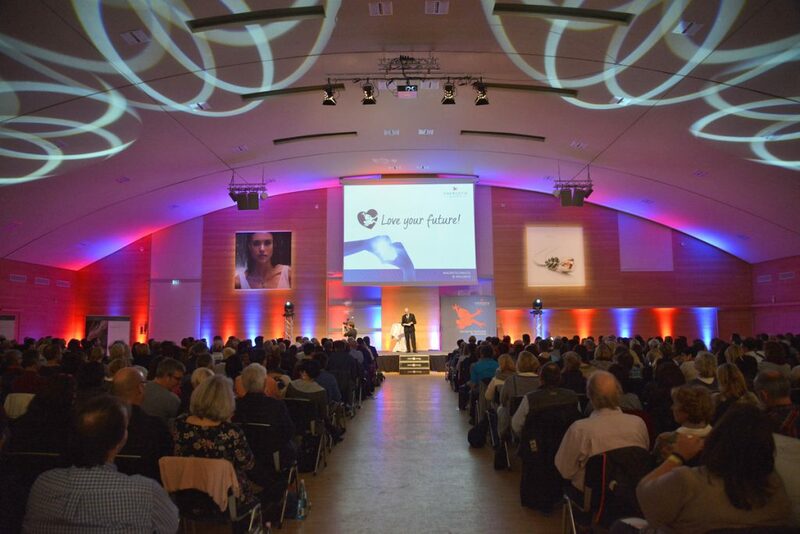 Roland Förster’s warmest of welcomes to the official event to kick off the year was followed by motivational thoughts relating to the new motto for 2017: Love your future! The event continued in an informative and entertaining style with Joey Kelly and the new sportEX bracelets. Joey talked about ENERGETIX’s participation in the RTL television channel’s telethon during which he had been given the exclusive opportunity to wear the new sportEX bracelet. It was clear that Joey is absolutely thrilled with the silicone bracelets that come with integrated magnets and that are available in two colours. He liked the fact that they were so strong and stable but were still so pleasant to wear. Joey revealed that he’s already looking forward to more sports challenges at which he’ll be wearing the sportEX bracelets (he also continues to wear them every day)! By the way, the participants at Willingen were given the exclusive opportunity to purchase the new sportEX bracelets before their launch along with caps and key rings bearing ENERGETIX’s logo and lots more. Be it the e-bike tour through Rheinhessen, the climbing trip to the Mittelrhein-Steig, the exploration of Strasbourg or the sailing excursion in Berlin: the attending STARCLUB members were asked on to the stage to be honoured sincerely for their special performances while atmospheric photos of STARCLUB events from previous and really successful years were being shown. One of the event’s highlights was definitely the highly anticipated presentation of the new SPRING / SUMMER 2017 collection that was introduced by two jewellery designers from Bingen. The response to the new jewellery creations based on major international trends couldn’t have been better. The revised wellness brochure with MagnetRelax mask and the new set of pieces for animals were welcomed by the audience. The business partners were then able to examine the new products up close at the jewellery stand. In view of 2016’s successful premiere, Jessica Schlick announced that the new collection will be going on tour again to resounding applause. In 2017, the new products will be stopping over in Germany, France, Austria, Switzerland and the Netherlands! 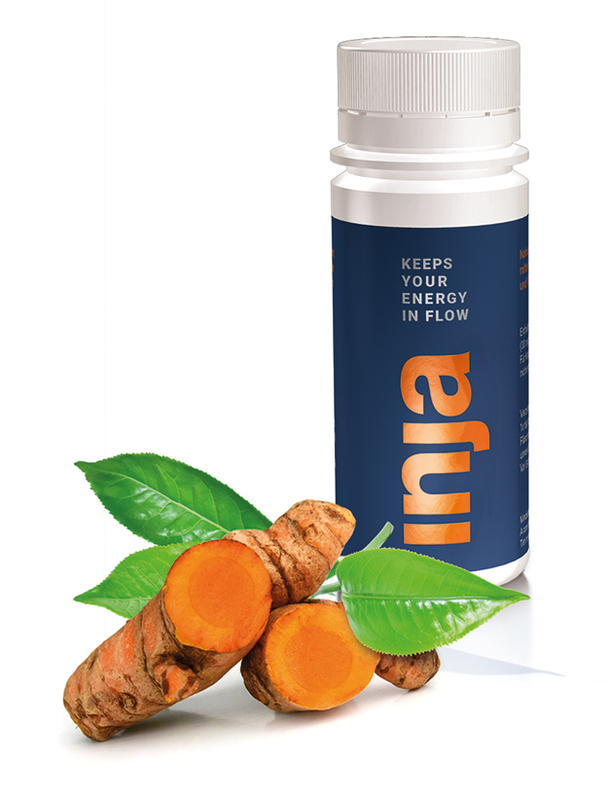 Then it was time to present the announced new product: Inja, the dietary supplement developed especially for ENERGETIX! The trailer that was shown at the event offered an initial preview before everyone was then able to join in and shake the bottles before tasting what was in them. 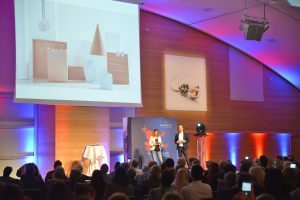 ENERGETIX’s Product Innovation Team with Jessica Schlick, Andreas Förster and Lisa Michaelis provided a detailed introduction to the newly developed product. Additional information was also presented directly from the product developer, Dr Eugen Becker, who had travelled to the venue specifically to attend the launch of Inja and share all the background information about the dietary supplement and its ingredients with the business partners. The response in Willingen to Inja, the unique dietary supplement containing turmeric, green tea and Q10, was so positive that nothing can now stand in the way of a successful market launch by the business partners. Alexander Link, CIO, took the stage to talk about sales news. In a way that was easy for everyone to follow, he explored, among other things, the new customer-management system (CRM) for sales, the ENERGETIX product app and other important tools that will provide even better support to business partners in future. ‘Love your future!’ – many ENERGETIX newcomers had already put the current motto into action without being aware of it. 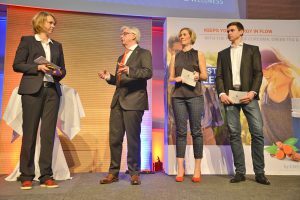 And their activities were recognized in Willingen: the three best newcomers in the PSV category who’d been active and whose career had rocketed since the Collection Premiere in Berlin were all specially honoured as were their mentors. The participants were particularly excited about the presentation of the restyled competition that is being launched under the motto of ‘Love Your Business’. Jessica Schlick showed that successful business partners were now able to choose from a broad range of interesting rewards. These included an iPad Air and a professional training session with a top coach! But no competition without the opportunity of being able to take part in a magnificent trip. Petra Schmeing, ENERGETIX’s Event Manager, who is already known to many from the numerous trips that she organizes and manages on location, presented this section of the event. To the accompaniment of impressive photos of nature, she announced that some people’s dreams are going to be realized: participants will be travelling to Iceland! The qualifying period closes at the end of April so there’s still lots of time to build up points! Roland Förster, Sole Shareholder and CEO, once again took the opportunity in his talk that concluded the official part to look back on this eventful day: a day that had delighted participants. Throughout the day, participants were able to purchase raffle tickets, the proceeds of which were donated to the Rabindra Puri Foundation in Nepal. The winners of the prizes – splendid jewellery sets – were announced shortly before the evening meal. The evening then presented the opportunity for participants to exchange experiences and re-establish already existing contacts, to make new ones and even renew friendships at the buffet that offered a wide variety of delicacies. All rounded off with music and dancing! Charged with energy from the day’s events, everybody then let their hair down at the party that followed. The DJ was able to lure the participants on to the dance floor (and tables) with popular hits. ENERGETIX’s business partners partied right into the night in celebration of themselves and the successful event! We thank all those who contributed on stage and backstage to making this event another unforgettable experience! Why not take a look at what happened? Here are the photos for you! Emotional and promising: Defining personal goals and implementing them – the collage training! 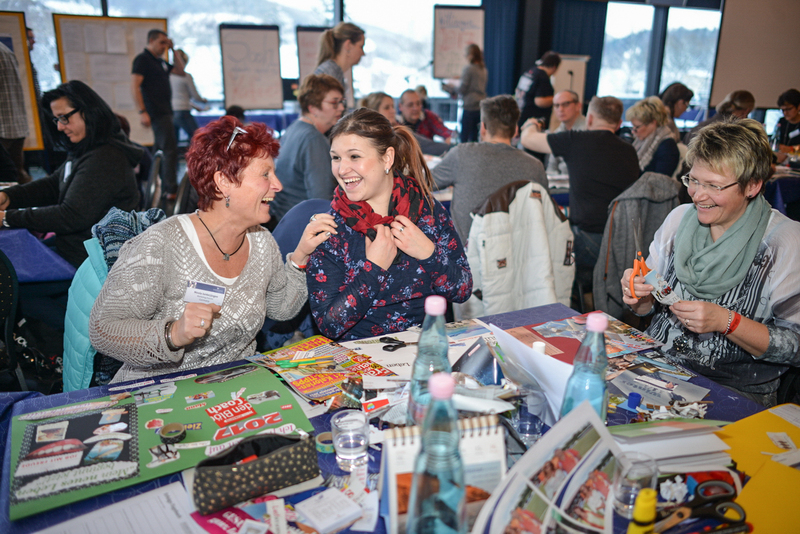 Already an established institution that takes place ahead of ENERGETIX’s event to kick off the year: the creative goal-defining collage training in Willingen! Everyone was cutting and gluing like mad on Friday. Nothing was left out, from personal development through trips of a lifetime to dream cars from the ENERGETIXDrive programme! 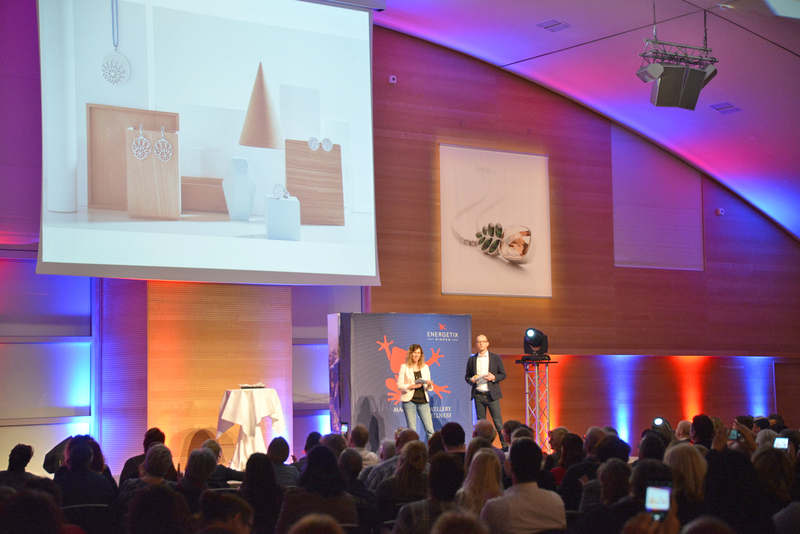 The creative goal-defining collage training with the experienced business partners, Ulrich Lang and Biba Marseglia, helped participants become more aware of their actual goals and so help them become better able to work towards them in future. The setting of personal goals and visualisation is seen as an important instrument in the achievement of one’s own dreams and the fulfilment of one’s own expectations. And the participants’ successes speak for themselves. Our thanks go to the organizers who once again pulled out all the stops to support the participants with advice and help at all times. We’ve put together a few impressions of the day in an on-line photo album for you. ENERGETIX’s French-speaking business partners met on 7 January in the first calendar week to kick off the year. More than 70 participants from France, Switzerland and Morocco had accepted ENERGETIX’s invitation and come along to ring in the new business year for 2017. We’d like to thank Josette Desassis and Anke Hesse-Michaelis at this point for preparing and organising the event and for their support on location!